PAUL BELLINGER PHOTOGRAPHY: MONTANA WEDDING PHOTOGRAPHY - SUPERWOMAN BRIDE! We made this photo way back when for Rachel’s bridals. But in the South they are sticklers about the tradition that the groom does not see the bride in her wedding dress until they are at the altar, so I could not share this photo anywhere until after the ceremony. In this photo Rachel is lit with one speedlight, held up in the air by Rachel’s awesomely named brother, Paul. Thanks Paul! To shoot like this you simply expose for the sunset, making sure to keep the shutter slower than the sync speed of your flash (usually slower than 1/200th of a second), and add in the flash until the subject is properly exposed. I’m not exactly sure how I ended up at ISO 1250. It was probably just where my ISO was set for the photos we took right before this, with all natural light. 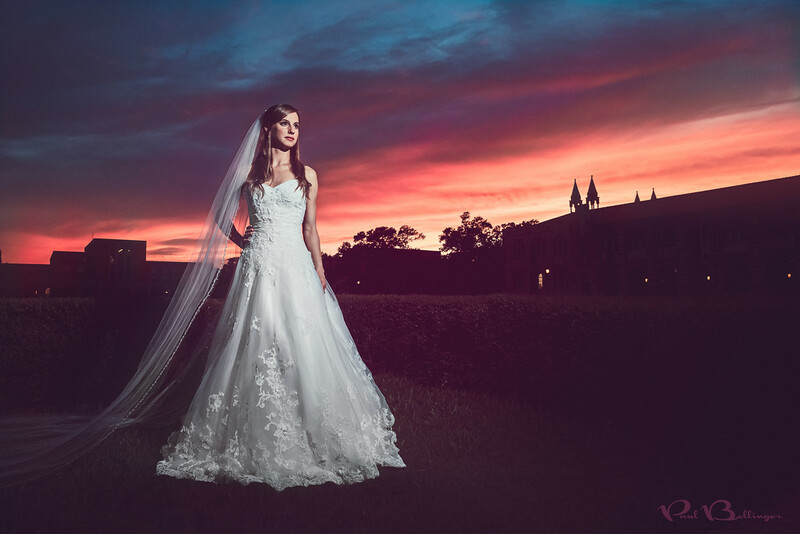 My artistic signature edit involved bringing out the sunset colors, creating a matte finish, adding film grain, and of course making sure Rachel’s dress is exposed for print. You can see something of a before version at the bottom of Sarah’s blogpost from this shoot.